Once a staple in the lexicon of every budding politico, a copy of Philip Gould’s The Unfinished Revolution tucked firmly under the arm, today the term “swing voter” appears only infrequently. Actually coming across a “traditional” swing voter (i.e. someone switching between the two main parties) appears to happen even less often. “Traditional” swing voters still represent a vital part of the electorate though. Quite simply, because they are worth double. Let’s say at a General Election, the Conservatives receive 40% and Labour receive 30% of the vote. At the following election, if Labour wins 1% more of the total vote share, taking it from people who voted for the Liberal Democrats first time around, it takes them to 31%, leaving them 9 points behind the Tories (who remain on 40%). But if instead, they win 1 percentage point from people who voted Conservative in the first election, it takes Labour to 31%, the Conservatives to 39% and the gap between them to 8 points. In other words, even though Labour only increases its own share of the vote by 1 point, the lead against them is reduced by 2. This is sometimes compared to the “six pointer” games that you get in football when teams at the top of the league play against each other. A win can be worth six points – the three they gain from the win, and the three their opponents miss out on from losing. With this in mind, and Labour searching for the votes to get them over the finish line, it is worth looking at the effect this type of swing voters is having. The graph below shows, over the course of this Parliament, the change in the proportion of those who say they voted for the Conservatives at the last election saying they would for Labour next time around. As can be seen, the proportion of 2010 Conservatives swinging to Labour rose slightly in 2011, and then more drastically in 2012, around the time of the Omnishambles Budget, to between 4-8%. Based on the Tories winning 37% of the vote in 2010, and 5% switching their vote to Labour next time, this would see the Conservatives’ overall headline figure reducing by just under 2 points, and Labour’s increasing by the same amount (5% of 37% = 1.85%). 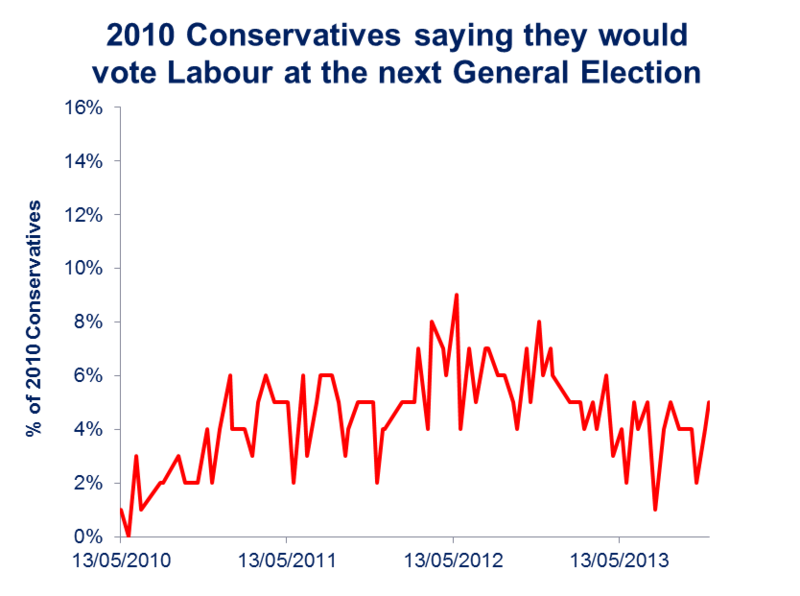 But this year, the number of Tory to Labour switchers has slowly eroded to just below 2011 levels. The question is, where have these swing voters gone? One theory is that people are simply demonstrating “false recall”. As the last General Election has moved further into the past, Conservative voters who are now saying they would vote Labour have either forgotten how they actually voted last time or are embarrassed to admit it. This may have some merit, but is by no means certain. A roughly similar number of people said they voted Conservative at the last election in our telephone poll in July 2013 (204) as did in July 2012 (201). But the 2013 poll showed one of the smallest numbers of Conservative to Labour switchers (1%), while the 2012 poll showed one of the highest (7%). 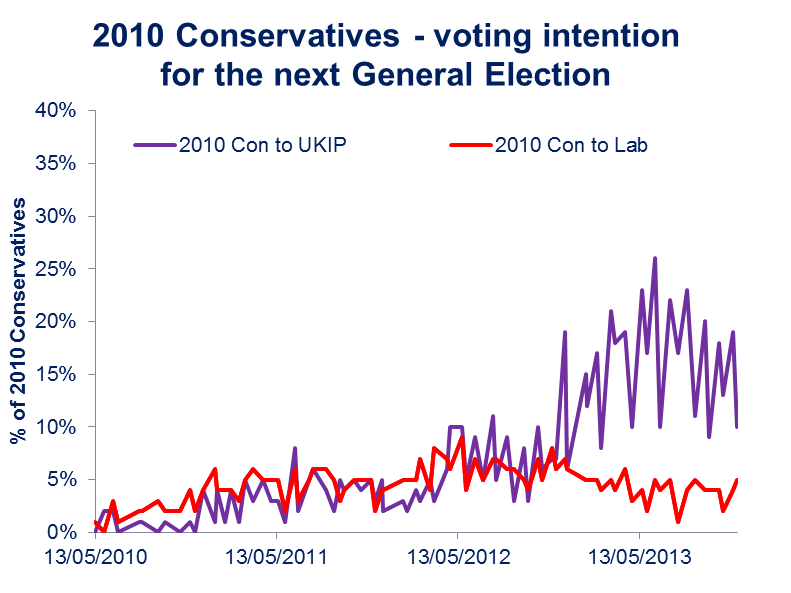 Instead, there seems to be another factor driving the decline in Conservatives to Labour switchers. Below is another version of the above graph. But the purple line has been added to include the proportion of 2010 Conservative voters saying they would vote UKIP next time. As can be seen, the decline in Labour swingers this year coincides with the dramatic rise of previous Conservative voters switching to UKIP. But the second is that the narrowing of the polls in favour of the governing party as the election approaches, which has happened to varying extents in the past, may be less dramatic this time around. Again, “traditional” swing voters are worth double: people registering a “protest” opinion mid-Parliament may well still return to the governing party at the time of the election. But this time the Tories’ vote share would be topped up with current UKIP supporters, and thus voters returning to their fold would not have the multiple effect of reducing Labour’s vote share. This would cause the poll gap to narrow at half the pace as would happen in a two-party pattern. Traditional binary swing voters are still vitally important – to both parties. But their relative decline in a multi-party system may cause the dynamics of the next election to behave in a slightly different way from how they have in the past. Both teams at the top of the league are choosing to focus their efforts on thrashing much weaker opponents, which may well provide a healthy goal difference at the end of the season. But as some pointed out when England got their difficult World Cup draw last week: to be the best, you often need to beat the best.